We are deeply committed to helping organizations protect their people, brands, and profits through fraud risk management and we appreciate the strong work of the ACFE to promote awareness of the issue. Fraud costs organizations worldwide an estimated 5% of their annual revenues, according to a study conducted by the Association of Certified Fraud Examiners (ACFE). The ACFE’s 2016 Report to the Nations on Occupational Fraud and Abuse analyzed 2,410 occupational fraud cases that caused a total loss of more than $6.3 billion. 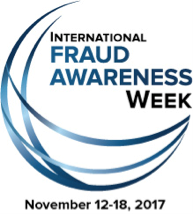 The seriousness of the global fraud problem is why Lowers Risk Group announced that it will participate in International Fraud Awareness Week, Nov. 12-18, 2017, as an official supporter to promote anti-fraud awareness and education. The movement, known commonly as Fraud Week, champions the need to proactively fight fraud and help safeguard business and investments from the growing fraud problem. Lowers Risk Group joins hundreds of organizations who have partnered with the ACFE, the world's largest anti-fraud organization and premier provider of anti-fraud training and education, for the yearly Fraud Week campaign. During Fraud Week, Lowers Risk Group will produce a series of informative blog posts and content on its Risk Management Blog at blog.lowersrisk.com. The company will also participate in the outreach via social media to further raise awareness. ACFE President James D. Ratley, CFE, said that the support of organizations around the world helps make Fraud Week an effective tool in raising anti-fraud awareness. Lowers Risk Group provides comprehensive enterprise risk management solutions to organizations operating in high-risk, highly-regulated environments and organizations that value risk mitigation. The company's human capital and specialized industry enterprise risk management solutions protect people, brands, and profits from avoidable loss and harm. With Lowers Risk Group you can expect a strategic, focused approach to risk assessment, compliance, and mitigation to help drive your organization forward with confidence. Learn more at http://www.lowersriskgroup.com.